On the first floor there is a double, en suite bedroom with southerly views and a second bedroom with twin beds. The ground floor has living and dining areas, including a well equipped kitchen with dishwasher. A further toilet and shower are here also. The living area has satellite freeview Sky TV and seating for 6. The dining area looks out onto the patio which is covered for shade and has a garden table, 6 chairs, 2 sun loungers and a BBQ. 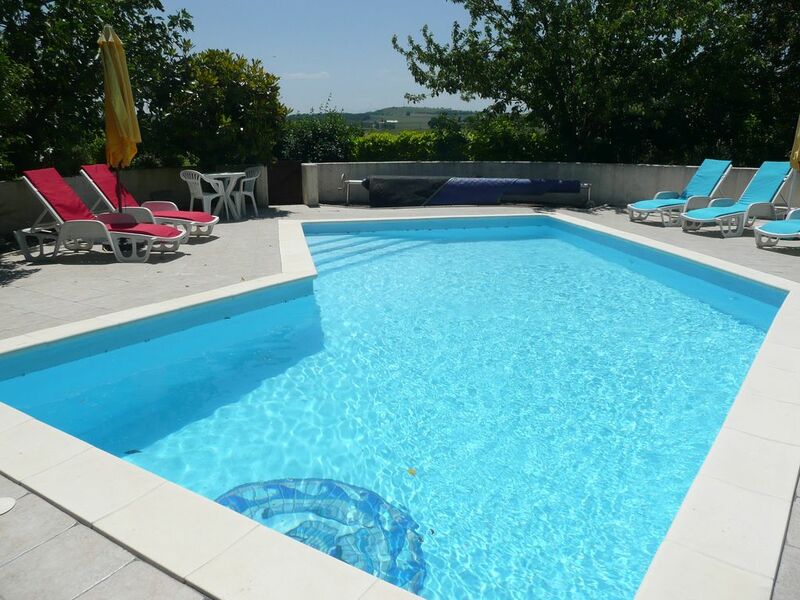 Brunet, a 200 year old former farmhouse has been recently restored with charm and comfort in mind. Stunning views of the Pyrenees as well as to the Montagne Noire to the North. In the grounds you can play boules, table tennis and badminton. There are bikes to hire near by for cycling along the Canal du Midi and plenty of local sights and activities. From golf to karting; lake activities to fishing. Skiing is possible in the winter although it is an hour and a half's drive to the slopes. We have enjoyed running Gites for 12 years now and each season brings new enjoyment to us as we meet new guests. We keep a discreet distance but are readily available for questions or any issues that might arise. The master bedroom en suite has a bath with shower over. Oil radiators and modern electronic paraffin stove. Laundry by owner for an additional charge. A modern kitchen open plan. On Lac St Fereol and the Aude river. Carcassonne has a reputed golf course and there is another by Pamiers. Both about 30 minutes away. Notes on accommodation: We have cots and a highchair for younger children. The swimming pool is walled and heated and the garden provides plenty of space to play or relax. All linen and towels for inside use are provided and for bookings of 2 weeks or more linen is provided for second and subsequent weeks. For the cooler months we provide both electric and modern paraffin heaters typical for this area). Outside: Each gite has a table, 6 chairs and 2 sun loungers under a covered patio, plus lawn to sit out on. There is also a barbecue per gite. Additional sun loungers and chairs are available around the shared heated swimming pool - dimensions 10m x 5m approximately. The Mediterranean coast is 50 minutes by car and there is a large choice of beaches and amenities. The nearest ariport is Carcassonne, 20 minutes away and there is also Toulouse. We can also be reached via Perpignan. Trains come to Bram, 10 minutes away and car hire is best arranged at Carcassonne airport. Domaine Brunet is best enjoyed with a car. Fanjeaux is 2 kilometres away and Bram 10 minutes. The medieval Bastide town of Mirepoix is 20 minutes as well as city of Carcassonne - famous for its medieval fortress. Fanjeaux has a superette, restaurant, bakers, butchers, pharmacy, cafe, tea room and petrol station. There are lovely walks from the house and lake swimming and castles and vineyards to explore. Children are well catered for with canoeing, aerial rope walkways, an underground river and mountain fortresses to explore. Booking Notes: More information on line at www.south-france-holidays.com. Book by telephone or email, a 20% deposit is required at time of booking with final payment two months before arrival date. Payments may be made by bank transfer Changeover Day: In the season the changeover day is Saturday. Between October and May this is more negotiable.